There are three kinds of Concrete Mixing Plant selection methods, the project has a large amount of work in the market, on the choice of medium-sized or large Concrete Mixing Plant, if the duration is short,then choose small sized ones. (1) According to the amount to choose Concrete Mixing Plant: concrete mixing plant is divided into small, medium and large size.If your projextwork on large and medium-sized mixing station, if the project is small, then select the small and medium-sized mixing Plant. (3) According to the composition of concrete and consistency aspects of selection: If The Mixing of concrete consistency and aggregate size is small,you should choose a larger capacity of the self-down mixer. If mixing consistency and large aggregate size of concrete, it is appropriate to use Mixing drum with faster speed self-drop Mixer. 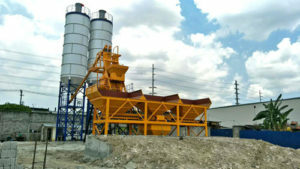 If the consistency is large and the aggregate size is small, it is advisable to use a forced-type mixer or a mixer with small and medium capacity.